"3 Lessons Children Can Learn From a Freelancing Parent"
"5 Ways to Break the Vicious Circle of Newbies"
"10 Marks of a Self-Disciplined Freelancer"
"20 Reasons To Say 'No' to Freelancing"
"96 Things Publishers Do (2016 Edition)"
"The Anatomy of a Hardcover"
"Are Edits Suggestions or Demands?" "Are Editors Born or Made?" "Ask The Chefs: What Advice Can You Offer Someone Seeking a Job In Scholarly Publishing?" "Can I Edit What I Am Not? Editing Outside Your Direct Sphere of Knowledge"
"The Career Leap from Proofreader to Editor"
"A Certificate Program and Certification Are Not the Same"
"Copyediting: A Duty of Care"
"The Copyeditor's New Brief: See the Big Picture"
"Copy-editors: What They Really Do"
" 'Diversity in Publishing' Doesn’t Exist—But Here's How It Can"
"Editing Science Manuscripts with a Humanities Background"
"Editors: Scourge of the Earth or Cheap Psychotherapists?" "A Fourth of July Lesson in the Value of Editors"
"Freelance Editors Aren't Entitled to Work"
"Freelance Editing: Drumming Up Business"
"Freelance Permissions Editor: Julie Cancio Harper at Permissions Trackers"
"From the University Presses—The Value Added by Copyediting"
"The Game of Successful Writing: A Poster to Increase the Visibility of Scientific Editing Services"
"Hail to the Copy Editor"
"How Do You Know When You Know Enough?" "How to Transition to Copyediting From Another Career"
" 'I Want to Be an Editor—When Will I Start Earning $?' and Other Unanswerable Questions"
"In Praise of Editors ..."
"Is Freelance Editing For You?" "Is Freelance Proofreading the Job for You?" 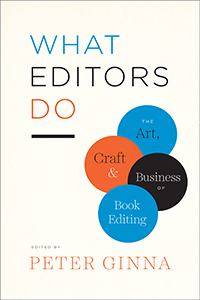 "Let Us Now Praise Editors"
"MET's Guidelines for Choosing an Editor, Translator, Interpreter or Other Language Consultant"
"Nine Things Good Copyeditors Do"
"The Novel Edits (Part 2)"
"Ode to a Copy Editor"
"On the Basics: Is There a 'Best Industry' for Editors?" "Printers, publishers, and . . ."
"Proofreaders-to-Be: Loving Books Isn’t Enough"
"Self-Inflicted Scope Creep and Perfectionism"
"Symbiosis: The Authorial and Editorial Process"
"A Tax Form for the Marginally Employed"
"Things I Wish I Had Known When I Started Freelancing"
"Thinking of a Career in Editing?" "Wannabe Editors: Can You Pass a Proofreading Test?" "We Treat with the Knife"
"The Very Model of an Amateur Grammarian"
"What It's Really Like to Be a Copy Editor"
"What People Think I Do/What I Really Do"
"What Should an Editor Be?" "What's the Point of an Editor?" "Why 'Amercia' Needs Copy Editors"
"Why Are Book Editors So Expensive??" and "The Other Reason Book Editors Are so Expensive"
"Why Does Editing Cost So Much? (Part 1)" and "Why Does Editing Cost So Much? (Part 2)"
"Why Does Editing Take So Long?" "Why Does Editing Take So Much Longer Than Reading for Pleasure or Interest?" "Why I Hate the Term 'Freelance Proofreader'—A Letter to Newbies"
"Why You Need a Professional Editor"